Interventions during labour and birth continue to rise in this country. According to new statistics from the Canadian Institute for Health Information, more than 103,000 c-sections were performed in Canada in 2016-2017. Other interventions in birth also continue to rise. For example, the rate of medically induced births has risen substantially in the last 10 years. With statistics like these, it’s not surprising that women planning a more natural childbirth may choose to take prenatal yoga classes and practice various breathing techniques and visualizations to prepare themselves for their labour both physically and emotionally. Acupuncture is another option that is getting more and more attention. Studies have shown that women who undergo pre-birth acupuncture treatments experience shorter labours, lower rates of medical inductions and c-sections, and a greater chance of normal vaginal delivery. 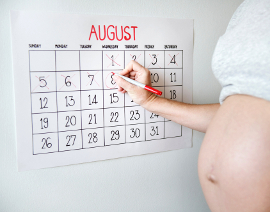 It is recommended that you start pre-birth acupuncture during week 36-37 of your pregnancy. Treatment consists of a 30 minute weekly acupuncture visit that incorporates a combination of preselected acupuncture points that have been noted to have a beneficial effect on labour and birth, as well as points chosen by your practitioner to address any individual health concerns such as stress and anxiety. Acupuncture points used are located around the ankles, feet, lower legs, shoulders, hands, and sometimes lower back. You will either be seated comfortably, on your back propped up with several pillows, or in a side lying position to create a relaxing treatment session. Acupuncture treatments are individualized to promote points to help reduce anxiety, encourage a pregnancy past its due date to move forward, or to help rotate babies presenting in a breech position. Many women are concerned about any risks involved with pre-birth acupuncture, such as inducing an early labour, but acupuncture has been shown to be safe during all stages of pregnancy when treatment is with a qualified and licensed practitioner who is educated on point selection and is aware of your health status. To learn more about Pre-Birth Acupuncture, contact Dr. Lesley, ND today!